Lt. Robert Kalamaras talks with a resident at Wednesday‘s Coffee with a Cop at Chip’s Restaurant. 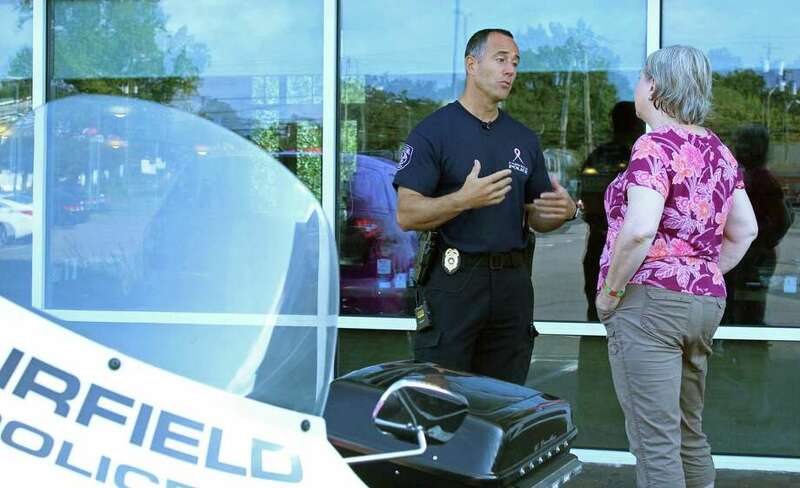 FAIRFIELD — Fairfield’s Police Department marked National Coffee with a Cop Day on Wednesday outside Chip’s Restaurant on Tunxis Hill. They took the opportunity to promote the town’s participation in the Norma Pfriem Breast Center’s Pink Pledge, with the department’s pink cruiser on prominent display. Officers were selling pink-trimmed shirts, similar to the ones they are wearing this month. Proceeds from the sales benefit the center. Lt. Robert Kalamaras said the coffee events are a way for community members to meet one-on-one with officers in a calm, non-emergency setting. The idea began in 2011 with the Hawthorne, Calif., police department. Department members were looking for better ways to interact with the citizens they served. The idea caught on, and Coffee with A Cop has spread to all 50 states. A national training program was established in 2013, and National Coffee with a Cop Day was first marked in 2016. It falls on the first Wednesday of October.